Munzee is a 21st century scavenger hunt whereby you search for items in the real world and capture using your smart-phone. Points are scored for each time you capture, deploy, and even when other players capture your deployed Munzee. 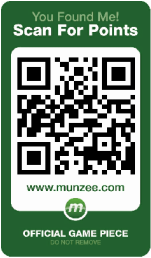 The Munzee consists of a QR code that contains the information of the Munzee, and once scanned/captured by using your smart-phone, the points are added to your account at munzee.com. The size of the Munzee will vary depending on where and how it is hidden, and more ideas are being thought of how to hide them as the game becomes more and more popular. Scan the Munzee here with a QR code reader, such as Qrafter, and it will show you how the information is contained in the code. For more help and advice, check out the 'Noobie Help' section. To join in the fun, download the app from iTunes or the android market now! Copyright Munzee Info 2013. All Rights Reserved.